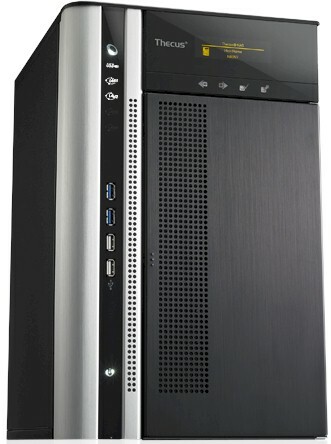 Summary Intel i3-based eight-bay high-performance BYOD NAS with USB 3.0, HDMI & audio I/O ports. Having reviewed Thecus' top-of-line Top Tower N10850 back in March, I initially was reluctant to review the eight-bay member of its "Top Tower" family. But since each member of the family uses a different Intel CPU (Table 1), I figured we might as well get all the different price / performance points into the NAS Charts. You can think of the N8850 as a slightly shorter, version of the N10850 with a slightly-less powerful CPU. Shorter, because it can accept eight 2.5" or 3.5" SATA hard or solid-state drives vs. the N10850's ten. The slightly-less power CPU is an Intel Core i3 2120 @ 3.3GHz vs. the N10850's quad-core Intel Xeon E3-1225 @ 3.1GHz. Other than that, virtually all of the commentary in the N10850 review applies to the N8850. So I'm going to skip all of that here. The inside story of the N8850 is very short. It is the same beastie as the N10850 with a shorter drive cage assembly holding two fewer drives. Everything else is the same...really. The shot below is reused from the N10850 review. Table 2 summarizes the key components used. The only difference is the number of Silicon Image SiI3132 SATA controllers. These are on the drive backplane and each one handles two drives. There seems to be one less than the number of bays. So I guess the processor companion device handles two drives. I used four 3 TB WD RE (WD3000FYYZ) drives, provided by WD, for testing. Power consumption measured 95W with the four RE drives spun up. This time I was able to get the drives to go into power save mode, which reduced power to a relatively low 45W. I once again heard the continuous clackety-clack that Thecus says is due to parity checking that I heard on the N10850. Also like the N10850, noise is rated as high, mostly due to fans. The N8850 isn't as noisy as a rackmount NAS with its smaller, screaming fans. But it's not something you would want to keep in your office, either. Thecus hasn't yet done a major overhaul of its OS as Buffalo, NETGEAR and QNAP have recently done. A look at the N4800 review will provide a good feature overview and you can use the online demo to get a feel for the user interface. The N7510 review describes the newer Data Guard, Data Burn, Local Display and Transcoding Service modules. Here's a shot of the Home page that you get when you first log in.